The new Port Mann Water Supply Tunnel will more than double the capacity of the existing water main, and help ensure continued reliable delivery of clean, safe drinking water to the municipalities south of the Fraser River. The new main is also designed to withstand a major earthquake. “The goal of this major infrastructure project is to construct a seismically resistant water main that will not be damaged by river scour, and will meet the needs of future growth in our region,” said Metro Vancouver Chair Greg Moore. “This new water main will replace the existing 40-year-old crossing, which was damaged by river scour. This tunnel construction is truly an amazing engineering feat,” he added. The tunnel is approximately 30 metres below the river bed, and was constructed between two 60-metre-deep vertical shafts, in which the 80-metre-long tunnel boring machine was lowered in February 2014 and removed on July 17. 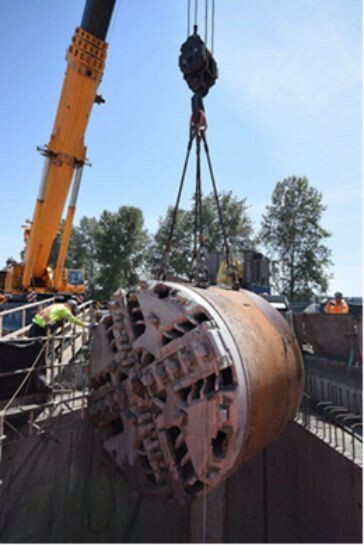 Now that the tunnel is complete, a new 2.1-metre-diameter welded steel water main will be installed in the tunnel and shafts, and will connect to the existing water transmission system by means of two new valve chambers, located at the top of each shaft. Installation of the new water main and construction of the south valve chamber will commence this summer, and the $240-million project is scheduled to be completed in fall 2016. The 3.5-metre-diameter, one-kilometre-long tunnel housing the main crosses between Coquitlam’s Maquabeak Park on the north side of the river, and the CN Thornton Yard in Surrey on the south side.